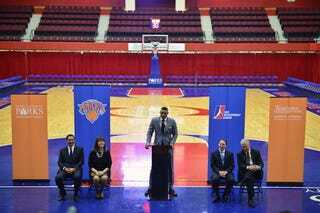 Last week, the Knicks announced they'd be soliciting fan suggestions for a name for their new D-League team, to begin play in Westchester next season. Three days before that, the Knicks filed for trademarks on five potential team names. So, good luck with your submission, I guess. The New York 914s (after the area code for Westchester County). The New York 'Bockers (self-explanatory). The New York Plainsmen (after White Plains, home to the Westchester County Center where the team will play). Fans will get to vote on the team's name in a couple of weeks, hopefully providing a nice distraction from that whole finishing-in-position-for-the-lottery-in-a-strong-draft-but-not-having-a-pick thing. Please leave your suggestion for the Knicks' D-League team below.